I forgot to bring, and thus wear, my wristwatch on a recent business trip. I missed my watch very much. But what I realized from this haphazard experience was that I didn't miss the watch because of its usefulness or because I had trouble ascertaining what time it was; I missed the watch because of how it made me feel, because of how it looked and felt on my wrist. This minor event has made me realize that the wristwatch has nearly no actual utility in a modern world. Between our mobile phones, computer clocks, and wall-mounted time-pieces, the wristwatch isn't really used to tell time. It has become an accessory. It is a luxury used to complement a wardrobe, distinguish status and wealth, or to be worn because of social norms. As our society has evolved technologically, the wristwatch has transitioned from being a tool that offered a high level of utility to now become a wardrobe accessory with little practical value. This has happened in a re latively short amount of time - probably most strongly correlated to the proliferation of mobile phones (which have digital clocks included) over the last ten years. 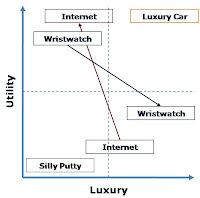 I believe that it's important to think of products and services through this relatively common and simple lens - on the spectrums of utility and luxury. It's especially useful to look at how different offerings have evolved and transitioned. It's these transformations (in any direction) that often unlock the greatest opportunities and that offer the greatest potential for innovation and profit.